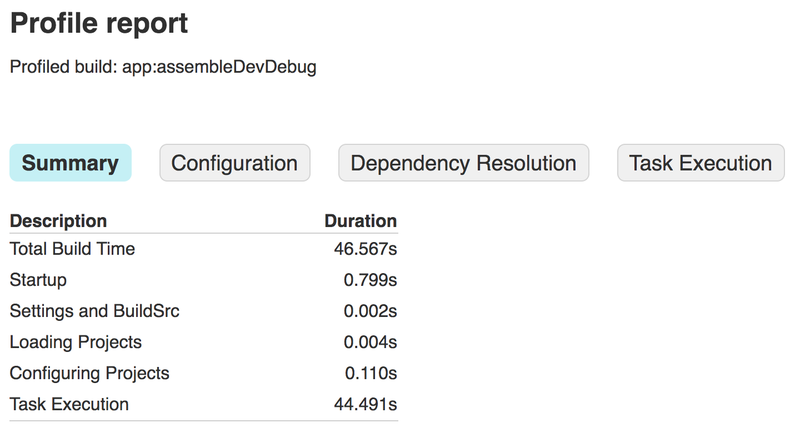 Long build times slow down your development process, so this page offers some techniques to help you resolve build speed bottlenecks. Optimize your build configuration by taking a few steps that immediately benefit most Android Studio projects. Profile your build to identify and diagnose some of the trickier bottlenecks that may be specific to your project or workstation. When developing your app, you should deploy to a device running Android 7.0 (API level 24) or higher whenever possible. Newer versions of the Android platform implement better mechanics for pushing updates to your app, such as the Android Runtime (ART) and native support for multiple DEX files. Note: After your first clean build, you may notice that subsequent builds—clean and incremental—perform much faster (even without using any of the optimizations described on this page). This is because the Gradle daemon has a "warm-up" period of increasing performance—similar to other JVM processes. Follow these tips to improve the build speed of your Android Studio project. // override those in the defaultConfig block. // API level 21 or higher—regardless of what you set as your minSdkVersion. // the defaultConfig block instead. You still need to create this flavor. // Otherwise, all variants use the "dev" flavor configurations. Syncing your project with your build configuration is an important step in letting Android Studio understand how your project is structured. However, this process can be time-consuming for large projects. If your project uses multiple build variants, you can now optimize project syncs by limiting them to only the variant you have currently selected. 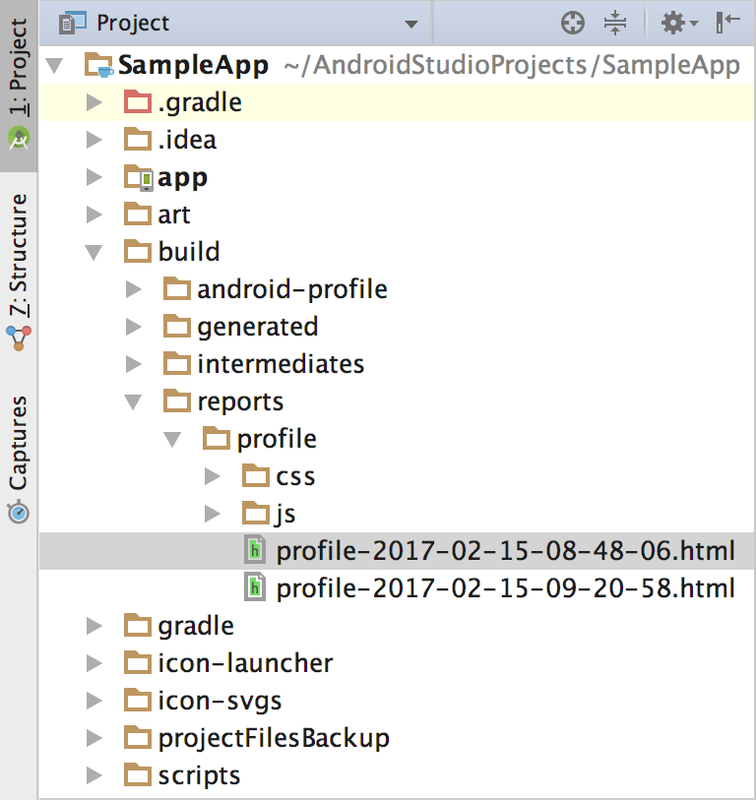 You need to use Android Studio 3.3 or higher with Android Gradle Plugin 3.3.0 or higher to enable this optimization. The optimization is enabled by default on all projects. To enable this optimization manually, click File > Settings > Experimental > Gradle (Android Studio > Preferences > Experimental > Gradle on a Mac) and select the Only sync the active variant checkbox. Note: This optimization fully supports projects that include Java and C++ languages, and has some support for Kotlin. When enabling the optimization for projects with Kotlin content, Gradle sync falls back to using full variants internally. // English stringresources and xxhdpi screen-density resources. // Initializes Fabric for builds that don't use the debug build type. For more information about optimizing your builds while using Crashlytics, read the official documentation. Always use static/hard-coded values for properties that go in the manifest file or resource files for your debug build type. If the values in your manifest file or your app resources need to update with every build, then Instant Run cannot perform a code swap—it must build and install a new APK. For example, using dynamic version codes, version names, resources, or any other build logic that changes the manifest file requires a full APK build every time you want to run a change—even though the actual change might otherwise require only a hot swap. If your build configuration requires such dynamic properties, then isolate them to your release build variants and keep the values static for your debug builds, as shown in the build.gradle file below. // must be updated (which is not supported by Instant Run). // need to rebuild the manifest (and therefore the whole APK, slowing build times). // changes those properties to something dynamic. When you declare dependencies in your build.gradle files, you should avoid using version numbers with a plus sign at the end, such as 'com.android.tools.build:gradle:2.+'. Using dynamic version numbers can cause unexpected version updates, difficulty resolving version differences, and slower builds caused by Gradle checking for updates. You should use static/hard-coded version numbers instead. If you are on a slow network connection, your build times may suffer when Gradle attempts to use network resources to resolve dependencies. You can tell Gradle to avoid using network resources by using only the artifacts that it has cached locally. Open the Preferences window by clicking File > Settings (on Mac, Android Studio > Preferences). In the left pane, click Build, Execution, Deployment > Gradle. Check the Offline work checkbox. If you're building from the command line, pass the --offline option. In the left pane, click Build, Execution, Deployment > Compiler. Check the Configure on demand checkbox. Gradle 4.6 users: If you're using either Android Plugin for Gradle 3.0.1 or 3.1.0 with Gradle 4.6, you should disable configuration on demand to avoid some unpredictable build errors. This issue should be fixed in a future version of the plugin. Look for code in your app that you can convert into an Android library module. Modularizing your code this way allows the build system to compile only the modules you modify and cache those outputs for future builds. It also makes configuration on demand and parallel project execution more effective (when you enable those features). After you create a build profile, if it shows that a relatively long portion of the build time is spent in the "Configuring Projects" phase, review your build.gradle scripts and look for code that you can include in a custom Gradle task. By moving some build logic into a task, it is run only when required, results can be cached for subsequent builds, and that build logic becomes eligible to run in parallel (if you enable parallel project execution). To learn more, read the official Gradle documentation. Tip: If your build includes a large number of custom tasks, you may want to declutter your build.gradle files by creating custom task classes. Add you classes to the project-root/buildSrc/src/main/groovy/ directory and Gradle automatically includes them in the classpath for all build.gradle files in your project. WebP is an image file format that provides lossy compression (like JPEG) as well as transparency (like PNG) but can provide better compression than either JPEG or PNG. Reducing image file sizes, without having to perform build-time compression, can speed up your builds, especially if your app uses a lot of image resources. However, you may notice a small increase in device CPU usage while decompressing WebP images. Using Android Studio, you can easily convert your images to WebP. // Disables PNG crunching for the release build type. Because build types or product flavors don't define this property, you need to manually set this property to true when building the release version of your app. Build your app using a debug build variant. Use Android plugin for Gradle version 2.3.0 or higher. Set minSdkVersion to 15 or higher in your app's module-level build.gradle file. Deploy your app to a device running Android 5.0 (API level 21) and higher by clicking Run . Open the Settings or Preferences dialog. Navigate to Build, Execution, Deployment > Instant Run. Make sure Enable Instant Run is checked. Build cache stores certain outputs that the Android plugin for Gradle generates when building your project (such as unpackaged AARs and pre-dexed remote dependencies). Your clean builds are much faster while using the cache because the build system can simply reuse those cached files during subsequent builds, instead of recreating them. New projects that use Android plugin 2.3.0 and higher enable the build cache by default (unless you explicitly disable the build cache). To learn more, read Accelerate clean builds with build cache. Android Gradle plugin 3.3.0 and higher improve support for incremental Java compilation when using annotation processors. So, to improve incremental build speeds, you should update your Android Gradle plugin and use only incremental annotation processors whenever possible. Note: This feature is compatible with Gradle versions 4.10.1 and higher, except for Gradle 5.1 (see Gradle issue #8194). To get you started, see the following list of popular annotation processors that support incremental Java compilation. For a more complete list, follow GitHub issue #5277. Some of the plugins may require additional steps to enable the optimization, so make sure to read documentation for each plugin. Glide 4.9.0 and higher: A media management and image loading framework for Android that wraps media decoding, memory and disk caching, and resource pooling into a simple and easy to use interface. Dagger 2.18 and higher: Provides a compile-time approach to dependency injection. Auto Service/Value 1.6.3 and higher: A collection of code generators for Java. Keep in mind, if you use one or more annotation processors that do not support incremental builds, incremental Java compilation is not enabled. If you need to use an annotation processor that does not support this optimization, include the following flag in your gradle.properties file. When you do so, the Android Gradle plugin executes all annotation processors in a separate task and allows the Java compilation tasks to run incrementally. Larger projects, or those that implement a lot of custom build logic, may require you to take a deeper look into the build process to find bottlenecks. You can do that by profiling how long Gradle takes to execute each phase of the build lifecycle and each build task. For example, if your build profile shows that Gradle is spending too much time configuring your project, it may suggest that you need to move custom build logic out of the configuration phase. Additionally, if the mergeDevDebugResources task consumes a large amount of the build time, it may indicate that you need to either convert your images to WebP or disable PNG crunching. Using profiling to improve your build speed typically involves running your build with profiling enabled, making some tweaks to your build configuration, and profiling some more to observe the results of your changes. With your project open in Android Studio, select View > Tool Windows > Terminal to open a command line at the root of your project. Perform a clean build by entering the following command. As you profile your build, you should perform a clean build between each build you profile because Gradle skips tasks when inputs to a task (such as source code) don't change. Thus, a second build with no input changes always runs faster because tasks are not being re-run. So running the clean task between your builds ensures that you profile the full build process. // On Mac or Linux, run the Gradle wrapper using "./gradlew". --recompile-scripts: Forces scripts to be recompiled while bypassing caching. --offline: Disables Gradle from fetching online dependencies. This makes sure than any delays caused by Gradle attempting to update your dependencies don't interfere with your profiling data. You should have already built your project once to make sure Gradle has already downloaded and cached your dependencies. --rerun-tasks: Forces Gradle to rerun all tasks and ignore any task optimizations. Figure 1. Project view indicating the location of profile reports. After the build completes, use the Project window navigate to the project-root/build/reports/profile/ directory (as shown in figure 1). Right-click the profile-timestamp.html file and select Open in Browser > Default. The report should look similar to the one shown in figure 2. You can inspect each tab in the report to learn about your build, such as the Task Execution tab which shows how long Gradle took to execute each build task. Figure 2. Viewing a report in a browser. Optional: Before making any changes to your project or build configuration, repeat the command in step 3, but omit the --rerun-tasks flag. 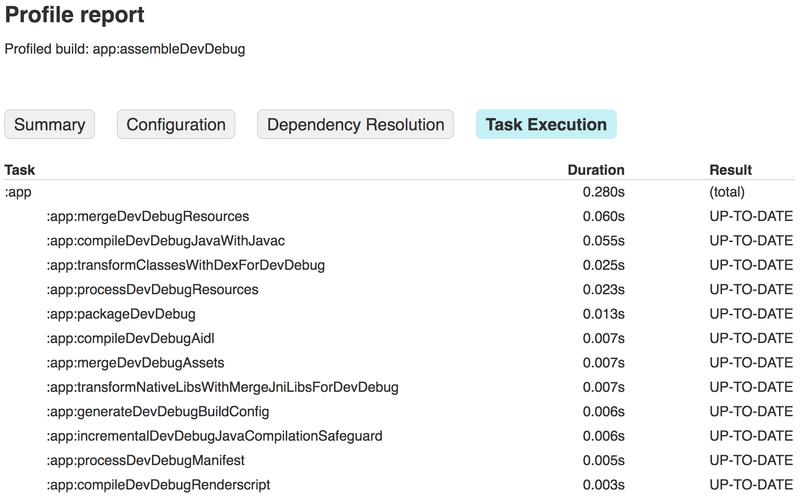 Because Gradle attempts to save time by not re-executing tasks whose inputs haven't changed (these are indicated as UP-TO-DATE in the Task Execution tab of the report, as shown in figure 3), you can identify which tasks are performing work when they shouldn't be. For example, if the :app:processDevUniversalDebugManifest is not marked as UP-TO-DATE, it may suggest that your build configuration is dynamically updating the manifest with every build. However, some tasks need to run during each build, such as :app:checkDevDebugManifest. Figure 3. Viewing task execution results. Now that you have a build profile report, you can begin looking for optimization opportunities by inspecting the information in each tab of the report. Some build settings require experimentation because the benefits may differ between projects and workstations. For example, projects with a large codebase may benefit from using ProGuard to remove unused code and shrink the APK size. However, smaller projects may benefit more from disabling ProGuard altogether. Additionally, increasing the Gradle heap size (using org.gradle.jvmargs) might negatively impact performance on low-memory machines. After making a change to your build configuration, observe the results of your changes by repeating the steps above and generating a new build profile. For example, figure 4 shows a report for the same sample app after applying some of the basic optimizations described in this page. Figure 4. Viewing a new report after optimizing the build speed. Tip: For a more robust profiling tool, consider using Gradle's open-source profiler.